Also check out this awesome Actual Play report from the forum! OK, not really. Makes for a catchy headline though. I did send him my stuff for review, and the Pundit certainly takes the time to go in-depth and deliver a thorough review no matter what his final judgment ends up being. He didn't like Green Devil Face, and you can read that review here. Hopefully we'll be seeing his reviews of Death Frost Doom, No Dignity in Death, and People of Pembrooktonshire soon. Five players came over last night to play Insect Shrine of Goblin Hill. I had only met two of them before, so I decided it was a good primer for the system (we're using Labyrinth Lord to run this, and to my surprise one of the new guys already had a copy of the new hardcover!... which I promptly inspected to see how the LotFP ad in the back turned out) to make characters at the table. I decided to start everyone at second level, and rolls were done 3d6 down the line, and if total ability score modifiers added up to at least 0 the character was kept. We ended up with a fighter, cleric, thief, magic-user, and dwarf. The first half of the session was establishing the "home base" of Gorsamfeld's Inn. This place was established some years back by a group of adventurers that had slain a dragon and then settled down. Various rumors about the environs, and adventure hooks, were conveyed both by Gorsamfeld's boasts and stories (he settled down as an innkeeper to win his adventurer-hating wife, and built it in the middle of nowhere so he could still have contact with those living "the life") and some of the randomly generated inn guests. From there they investigated an oddly constructed, oddly placed tower. No, not The Tower, but I would have been tempted if I didn't know that four people at the table owned it. ;) They overcame the griffon thereupon and succeeded in recovering its valuable eggs, but at a high price: The thief and dwarf met their doom, while the fighter and cleric were rendered unconscious. It all came down to the magic-user and his last dart. Very close call. The advice for running the Inn. I wrote the darn thing and I was quite tempted to try to present everything involved and I was in danger of getting lost. There are two dozen described NPCs that live and work in the place, and a random table of inn guests that are present at any one time. It's overwhelming to try to describe it familiarly and intimately like the PCs are regulars on the set of Cheers or something (did I just date myself with that reference?). I believe the included scope and variety are good so as to provide many possibilities for the Inn portion of the adventure, but encouragement to narrow it down depending on referee tastes and what the PCs are doing might be in order. Include some of the dialogue I came up with for Gorsamfeld to further establish his character. He runs the "home base" and is quite interested in interacting with the PCs so I suppose further characterization in print might be wise. The line that the players seemed to like (talking about boastful adventurers) went something like this: "Many have claimed to have gone to the tower, but none of them have mapped it, you know what I mean?" Not expecting the open "sandbox" aspect of the adventure. Surprised that neither the "Insect Shrine" nor "Goblin Hill" were seen, or even hinted at in the adventure thus far (aside from some graffiti in the tower, but without the players having been told that we're running Insect Shrine that wouldn't have seemed at all relevant). But I've always been of the opinion that there should be a logical reason why an adventure location hasn't already been solved/cleared out (especially an area intended for lower level schlubs). "It's not on the map and nobody talks about it so nobody knows it's there," is an excellent way to explain why people haven't looted a location! The plan is to play the Shrine adventure again next Wednesday, subject to the official LotFP proofreader's approval, of course. But yeah, we actually started to play Insect Shrine of Goblin Hill. It's real! It's really real! LotFP Releases Now Available in France through Ludikbazar! LotFP has added another vendor to the family: France's Ludikbazar. We want to support the new territory and partner with French language reviews, so if you know of, or are, a French RPG reviewer that is at least open-minded about traditional gaming and has an audience, let us know! Art by Laura Jalo. I'm not entirely sure what to do about logo placement and effects though. What do you think? Laura says the interior art should be done in the next couple weeks, and Mr. Dow says the maps should be done soon. I'm working with the printer to come up with an affordable yet impressive physical format. The original idea would have looked spectacular but cost $15 through Noble Knight, plus shipping, which is excessive since the actual adventure content, sans maps and handouts, is 16 pages. The US really has to do something about this Euro-Dollar exchange rate. When all those elements comes together, this will go to press. I'm still finagling Insect Shrine playtest dates, and in the meantime, the next project is underway, with the working title The Old Miner's Shame. It will be a short dungeon adventure (maybe 12 pages, maybe 16, with just one map) about dwarves. 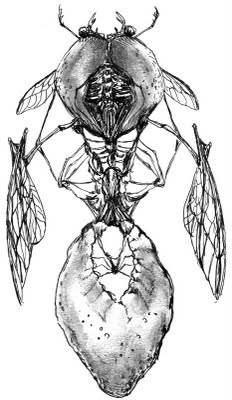 I have some larger projects on the horizon (the Sanitarium project and an introductory box set RPG) but I don't want to get busy with anything large until Insect Shrine is out the door. I picked up Death Frost Doom's second printing today. The map has been made clearer to address earlier complaints and some minor graphic design upgrades (including an ISBN! wooo! ), but is otherwise identical to the first printing. If you bought Death Frost Doom for gaming, there is absolutely no need to buy again as all the art and text (barring a couple corrected typos, and lord knows what new ones) is identical to the original version. Acaeum and other collecting types are encouraged to buy the same darn thing again because it's a new printing. :D You'll have to order direct because no vendors have them yet. I'm also today sending vendor solicitation packages to Belgium, the Netherlands, the UK, Singapore, Italy, the Czech Republic, Hungary, Poland, Sweden, Austria, and Denmark. Who are you people and why are you looking at me? Forget OSRIC, Labyrinth Lord, and Swords & Wizardry. Forget Castle Zagyg, Carcosa, and Fight On! If you're looking for the monumental and important release of the OSR, you haven't yet found it. The Dungeon Alphabet by Michael Curtis is it. Maybe, you might say, I'm just shilling for the publisher that published my own Random Esoteric Creature Generator. But then I'd ask you to explain my silence concerning all their other releases, system neutral or not. The artwork is breathtaking. It's got the most evocative Jeff Easley piece I've ever seen, and Jim Holloway brings his A-game. Jim Roslof's got a fair number of illustrations in here, and the way he illustrates wonders of the dungeon makes me like these pieces than anything he did for TSR in the "glory days." (I use quotes because in many ways, the glory days are now) And then there's Erol Otus, but unlike the others, I don't think his contributions match up to what he did back in the day. Then there's the current crew, including Pete Mullen, with impressive pieces. As I moved from page to page, I was almost expecting to see Elmore, Darlene, Dee, Trampier, and Sutherland work. No such luck (for obvious reasons), but the aura of the book just makes it seem possible. Then there's the writing. A lot of us read the original Dungeon Alphabet on the Society of Torch, Pole, and Rope blog (which should be mentioned in the introduction at least, but isn't). I have it in my Referee Notebook. But each entry is expanded with a sample random chart to demonstrate possibilities. Some of these charts are more impressive than others. The Altar tables give 8000 possible combinations, but others are rolled on a single d6, d8, d10, or d20 table and so have finite variations. Again, illustrating possibilities rather than being true generators in their own right. Still, it can hardly be argued that an imagination jumpstarter is a poor product. This isn't advertised as and isn't intended to be a dungeon generator, after all. The most important thing about this is going to be the scope. Goodman Games isn't Wizards of the Coast in terms of visibility or market penetration, but they are investing in a hardcover book that's all about the dungeon as adventuring environment rather than dungeon as background for action, and putting it out in game stores. It's going to get reviewed and talked about, at the very least, and discussion of The Dungeon, and many of the Old Ways, are going to be discussed in general gamer circles. This is going to remind many old-schoolers of things that have been forgotten, and this is going to teach many youngsters lore that hasn't been out to the general gaming public in a long, long time. The Dungeon Alphabet feels like coming home. RPG Circus Podcast Episode 9 Featuring LotFP Now Online! It was fun, although I was a bit nervous because it's a bit difficult to figure out when to talk when there are four people on the line that can't see each other. :) I've had experience doing my own internet radio show but that was a one-man gig and when I used to make appearances on WREK in Atlanta, everyone speaking on the air was around the same desk so we could take visual cues on when to talk and when to shut up. And was anyone here listening the first time I was on the air and completely froze? haha! Good times! In retrospect. Let me (and them!) know what you think about the episode. Contrary to popular belief, I don't enjoy the sound of my own voice (just the appearance of my own words!) so I can't bring myself to listen to the completed podcast. You must be my quality control so I know what to beware of the next time I do one of these. In a manner of speaking, anyway. The order has just been placed, and tomorrow we'll be sending out a package to Ludik Bazar with the full current range of LotFP releases. I'll post another update once the items have arrived and are available for sale on the site! When I say "most unfair situation" or "prick writer's players must have pissed in his Wheaties," what published example do you think of, and why? You know, those little things that give you an evil, evil smile when you read them, but you know you have to remove all the d4s from the table before presenting it for play? Why do I ask? No reason. None at all. The LotFP Message Board is Live! The new LotFP message board has been set up and is ready for your questions, comments, and criticism. The crew on the All Games Considered podcast talk old school games, including a twenty minute segment about No Dignity in Death, People in Pembrooktonshire, and Death Frost Doom. The entire episode is about 90 minutes long (and has a lengthy overview of Mutant Future! ), and the LotFP segment is around 27:00 - 47:00. ... to attempt to write adventures that take advantage of the pecularities of a certain medium, and the differences and focus between certain editions? Or at least the commonly-perceived differences? I ask because as pre-playtest writing for Insect Shrine is complete, I'm turning my gaze towards The Grinding Gear. It's an adventure I've run for groups in two different cities, and at least in my mind it's something that wouldn't play at all the same in later edition games as it would in its intended early-edition. At least not how online commentators and Actual Plays portray the editions as being played. And that's why it's next on the list. It is a cruel one. It's not a grinder (it could be with careless play), but it is cruel, and both groups that made it out failed to find the treasure (during the initial foray, anyway). Of course, one idea behind No Dignity in Death is that it was something that takes advantage of the humans-at-the-table factor of RPGs. I have this idea in my head that computer games don't deal with the human interaction factors so well (which is the focus of the first two parts of that module). Of course, I haven't played a computer RPG since Ultima 7b, so who knows. So the question: is it possible to make an adventure without intrinsic heavy system content that really is edition-specific to where it doesn't port over to other editions or games without losing its core? If you think the answer is yes, do you have existing examples to back that opinion up? And another question is, if it is possible, is it complete stupidity to do so, business-wise? Is it my job to highlight the strengths and differences of the clones and early D&D editions versus other fantasy games? Should I just try to make quality adventures, with stats for my favored games, that are also easily converted to Pathfinder or Burning Wheel or Warhammer or Call of Cthulhu (all of those are games that people have told me they've used to run my stuff) or whatever else? Aresupporting the cause and doing what's best for business conflicting interests? As far as Insect Shrine goes, at my normal Sunday game I had players wanting to set up some extra game time to do that module. If I can get that all together, then what I might do is run the "full" version with them, and then do Skype sessions with you internet people as one-shots for the different areas in the module. I have a feeling that the Death Frost Doom playtest, and the resulting pre-release chatter, is one reason why the module became an OSR-level hit. 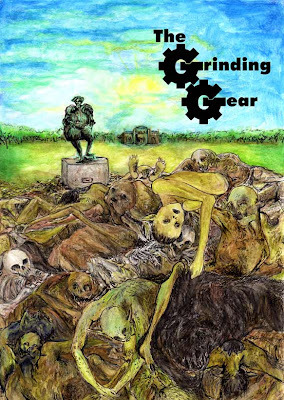 Makes me think I should do a Skype game of Grinding Gear when the manuscript is finished, even if it is a complete and playtested adventure. Or maybe "simple dungeon" is more appealing than "multi-session adventure," in which case Insect Shrine is in deep trouble (and so am I with all the money going into it :P) and Grinding Gear will be more than fine. ahhh, don't mind me. I already know what I'm doing, that's not what I'm questioning. What I am questioning is how you're going to react to it. Cogito, ergo ludo says a few words about playing Death Frost Doom, apparently using the Burning Wheel system. One of the players from my Sunday group, who also contributes to Green Devil Face, has started his own blog here. Check it out. Savage Swords of Athanor talks about them here. ... and as of this week, all completed work has been paid for in full. Still working through map issues and still waiting on Aino's FillerBug. I'm doing some "who did what?" from the Fiend Folio, and I find that it's his name (more than Gygax's!) that keeps popping up in the "I've used that in actual play!" stakes. So who can tell me more?